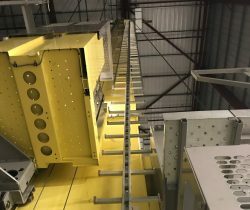 Replacing old with new, leaders in safety at height, Heightsafe Systems were asked to replace P&G’s emergency rescue ladders with a more robust product. P&G are a multinational manufacturer of product ranges including: family, personal and household care products. 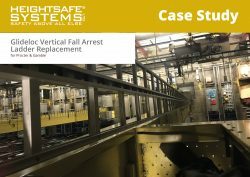 Without hesitation, they contacted Heightsafe Systems to replace Fall Arrest Ladders on multiple high bay automated palletizing cranes at one of their larger plants that facilitates product supply around the UK. Their new Glideloc Vertical Fall Arrest Ladder utilises a rigid track which is fabricated into the ladder itself and is operated by a travelling connector device that allows entry and exit at any point on the ladder. In the event of a fall, the traveller will lock into position and an internal shock absorber is activated to reduce the load on the user and structure. 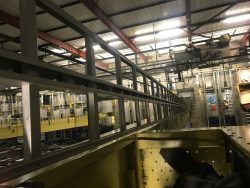 With a total of 6nr replacement ladders in total (some as high as 45metres), Heightsafe Systems were able to work alongside crane operators and P&G to ensure minimal disruption to their warehouse and completed the project within 2 weeks.